Narcotics Detective, Billy Duke escorts 32 year old Jay Pickney Moore of Livingston to a unit for jail transport. Moore was charged with possession of a controlled substance. Narcotics Detectives Arrest 3 on Drug Related Charges (one for Child Endangerment), LIVINGSTON, February 14, 2014 - According to Polk County Sheriff, Ken Hammack, on Thursday February 13, 2014 Detectives with the Narcotics Division from the Polk County Sheriff’s Office conducted a traffic stop involving suspects in an ongoing investigation. The investigation was involving the use and sale of methamphetamine in the Polk County area. After Detectives observed a vehicle driven by Valarie Strasheim, 28, of Livingston, driving erratically the vehicle was stopped. Inside the vehicle was passenger’s Jay Pickney Moore, 33, of Livingston, and Valarie’s 4 month old son. A search of Pickney's person resulted in Detective’s locating a syringe used to inject methamphetamine. A further search of the vehicle produced another syringe used to inject methamphetamine along with two bags of synthetic marijuana. Jay was placed under arrest and transported to the Polk county Jail where he was found to in possession of prescription medications in his genital area. After the initial traffic stop another traffic stop was conducted later on Thursday February 13, 2014 in reference to the above traffic stop by the Narcotics Division and Criminal Investigation Division which yielded approximately 30 grams of methamphetamine and 44 grams of Kush traveling from the Houston area to be sold to Polk County Residents. The driver of the vehicle was identified as Misty Ann Wellons, 32, of Livingston. Wellons is currently out on bond for methamphetamine charges from Harris County and 3 charges of delivery of methamphetamine out of Polk County. This is the sixth pending felony narcotics charge Misty is facing. Jay Moore was booked into the Polk County Jail for introducing contraband into a correctional facility, possession of a controlled substance less than two ounces (felonies) and possession of drug paraphernalia. 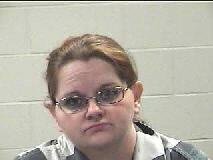 Valarie Moon was booked into the Polk County Jail for endangering a child and more charges pending. Misty was booked into the Polk County Jail for Manufacture/Delivery of a Controlled Substance Penalty Group 1 more than 4 grams but less than 200 grams and Manufacture/Delivery of a Controlled Substance 2A more than 4 grams but less than 200 grams (both felonies). This is an ongoing investigation and more arrests are expected to come in the near future. Valerie Moon looks on as Narcotics Detective, Billy Duke cradles her 4 month old son. Moon was placed under arrest for child endangerment. Detective Randy Turner (right) initiated the traffic stop that lead to the discovery of drugs in the vehicle. 32 year old Misty Ann Wellons, of Livingston, was later arrested in connection with the incident. Wellons was in possession of a large amount of methamphetamine and charged with 2 counts of manufacture and delivery of a controlled substance. Deputy Mike Nettles watches Moore as narcotics detectives conduct a vehicle search of Moore's Toyota Camry. Detective Randy Turner loads evidence into a patrol unit (glass pipe is visible).